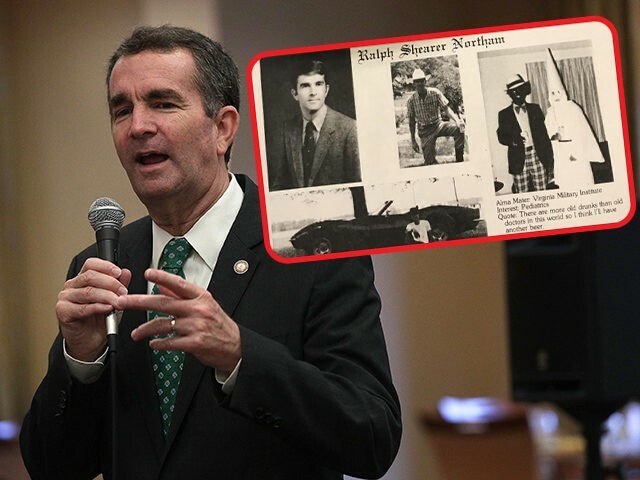 Voices on the left calling for Democrat Virginia Governor Ralph Northam to resign are piling up, after a medical school yearbook photo of him in black face or a KKK robe surfaced on Friday. We don't tolerate racism from either side of the aisle. Progressive groups MoveOn and DemocracyforAmerica began circulating a petition calling for his resignation. Just In: @GovMurphy, the incoming head of the DGA, calls for Northam to resign. "I don’t see the governor has any other choice other than to step aside." Northam released two statements apologizing for the photo, but not clarifying whether he was wearing black face or dressed in a KKK robe. His apologies did not quell the growing number of Democrats calling on him to resign. The list of Democrat lawmakers also calling for Northam to resign is also growing. So far Sens. Kamala Harris (CA) and Elizabeth Warren (MA) have called on him to resign. By Friday evening, Democrat Reps. Ted Lieu (CA), Eric Swalwell (CA), Ro Khanna (CA), and Elaine Luria (VA), also called on him to step down. However, some on the left stopped short of calling on Northam to resign. Virginia Sens. Tim Kaine (D) and Mark Warner (D) called the picture “shocking” and “horrible” but said vaguely that Northam should reflect and consider what comes next. Sen. Kirsten Gillibrand (NY), a 2020 hopeful, also did not immediately call for Northam’s resignation. “I think he needs to explain to the voters of Virginia what that was about and I think he needs to apologize,” she said in a statement.